Learn how a startup used non-invasive biosensors to create a patch that analyzes your sweat, and connects with your phone. The number of smart wearable devices has mushroomed in recent times, and one of the more interesting areas has been in devices designed to analyze your sweat. Whereas a Dutch team has developed one such device that will analyze your sweat for signs of illness, the majority of efforts have been more performance related. For instance, a team from UC Berkeley developed a sweat band that was capable of analyzing your sweat for dehydration levels (among other things). “Human sweat contains physiologically rich information, thus making it an attractive body fluid for noninvasive wearable sensors,” the researchers say. One company that’s attempting to move such thinking from lab to market are San-Francisco based startup Kenzen. They’ve developed a peel-and-stick sensor that evaluates your sweat to provide predictive analytics for your sports performance. The system revolves around a biosensor that the company calls the Echo Smart Patch. It’s designed to be worn all of the time and provide real-time analysis of your sweat. The metrics returned include your hydration levels, calories burned, electrolyte balance and glucose levels. 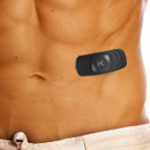 The sensor is worn a bit like a heart rate monitor and fits on the rib cage. It connects to an app on your phone via Bluetooth and will send smart alerts to the user if their readings drop too low. The company has developed all of the technology, including the AI engine that analyzes the data. It’s been designed to take into account ambient factors such as temperature and humidity to provide you with greater insight into your hydration levels. The product is currently in the latter stages of development, with prototypes being tested in the field. The next step will be to explore the various options for manufacturing and bringing the product to market. There is already a partnership with the San Francisco 49ers gridiron team, and it will be fascinating to see how it develops.